:Just as a physically healthy person--at an ideal weight and with good blood pressure and cholesterol numbers--might not actually be fit enough to run a 5k, so churches can appear healthy--with no obvious issues, maintaining a healthy size--and yet not exhibit fitness. A fit church is one that is not satisfied with merely coasting along with no problems. A fit church is actively making disciples, maturing in faith, developing strong leaders, reaching out to the community, and more. 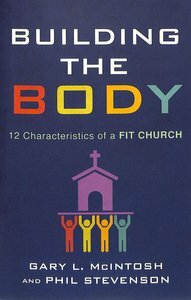 About "Building the Body: 12 Characteristics of a Fit Church"
As a senior pastor, Phil Stevenson lead two of his congregations in the parenting of seven new churches. He is now a senior consultant and coach at New Church Specialties, an organization that assists in the starting and strengthening of churches worldwide.